Asus India marketing effort ramping up. Teaser #2 on their Facebook page. Days, not weeks, that’s our feeling now with the upcoming ZenPad launch in India. If there is one particular model of ZenPad that you are excited about and want to buy, please let us know in our poll question here which is for anyone who is currently living in India. If you live in India, it’s important to voice your opinion. Not all models of ZenPad show up in every market! 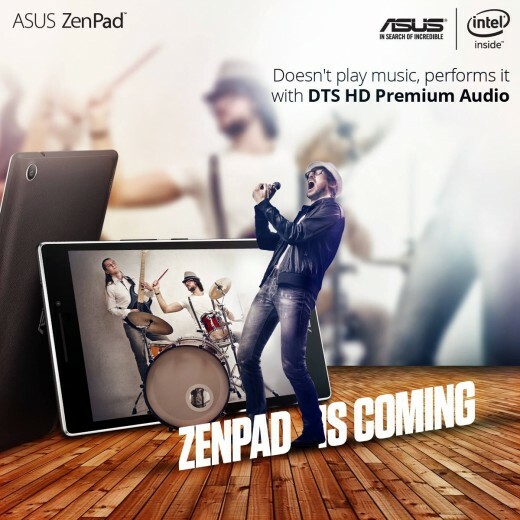 The latest Asus teaser is displaying “ZenPad is coming” just like the first teaser, except this time they are trumpeting the audio and the DTS HS Premium Audio of the ZenPad tablets. There is no question that the front facing speakers on the ZenPad tablets is a strong selling point and it’s something that a lot of the competition doesn’t have. It’s funny with tablets that audio is important to a lot of what we use our tablets for, yet in most designs, the speakers are not front facing. Is that an Apple effect? Consider the fact that any home speaker setup, or any speaker setup, anytime and anywhere, the speakers are facing the viewing area. Pointing at the listeners ears! Why then the consumers don’t demand speakers on a tablet that are front facing is a bit baffling from a logic perspective. Speakers are to face the ears and the audience. Period. If not, then it’s a flawed listening experience. There is no other way to say it. Regarding speakers and the ZenPad series, it’s the ZenPad S 8.0 and ZenPad 10 that have dual stereo front facing speakers. The ZenPad C 7.0, 8.0, and 7.0 have a single front facing speaker.